A memorial service honoring the live of Becky Douget, age 70, of Centerville, will take place 10 A.M., Saturday, January 19, 2019 at Walters Funeral Home in Centerville, Texas. Pastor Joel Douget will officiate the service. Becky Douget was born Rebecca Sue Young June 19, 1948 in Houston, Texas. Her parents were William “Bill” & Verna (Dolezal) Young. She and the rest of her siblings were raised in the Houston area. Becky married Donald Gene Douget, Sr., and they raised three children together. Becky was a devoted wife and homemaker to her family. She also ran several successful business including interior design and jewelry making, as well as, worked as a substitute teacher when needed. Becky and her husband moved to the Leon County area in 1986. She eventually became involved in numerous community organizations, such as, 4th of July Committee, Economic Development Committee and the Elmer P. & Jewel Ward Memorial Library. She was also a huge support to her husband during his time as Leon County Judge and in the numerous organizations in which he was involved. Becky, along with her daughter, Michelle, also ran a successful daycare business in Centerville for a number of years. When Becky had a few spare moments she enjoyed reading, word puzzles, traveling, her cats and spending time at the “camp” on her property. She most especially loved her grandchildren and spent as much time with them as possible. 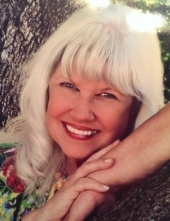 Becky passed away Saturday, January 12, 2019 in Houston following a lengthy illness. She was preceded in death by both of her parents; husband, Donald “Gene” Douget, Sr.; daughter, Melissa (Douget) Pierce and brother, Curtis Young. Surviving family members include son & daughter-in-law, Donald Gene, Jr. & Carolyn Douget of Leona; daughter & son-in-law, Michelle & Chad Clossin of Centerville; brothers, Bill Young (Ruth) of Houston and Randy Young (Gayle) of Thailand and sisters, Robbi Orr (Woody) of Washington State and Kathy Bishop of Houston. Becky is also survived by five grandchildren, Jake, Ty & Samantha Douget and Ethan & Brea Clossin. To send flowers or a remembrance gift to the family of Rebecca S. "Becky" Douget, please visit our Tribute Store. "Email Address" would like to share the life celebration of Rebecca S. "Becky" Douget. Click on the "link" to go to share a favorite memory or leave a condolence message for the family.